Pictured below are Robert (trustee), Kerryanne (treasurer), Mark (modelling), Kathleen (admin), Jonathan (trustee), Colleen (trustee), Tom (trustee), Kelvin (chairman), Evan (lending) and Jenny (promotions) at our 20th birthday celebration. Kelvin is married to Kathleen and they are very proud of their three children and nine grandchildren. We are very pleased to have Robert Cleland as part of our team of Trustees. Robert first assisted Liberty Trust as Budget Advisor for many years, helping people struggling with debt. Robert is well known in dairy circles, as chairman of the BOP Holstein-Friesian Club and breeder of the Paroa stud cattle. 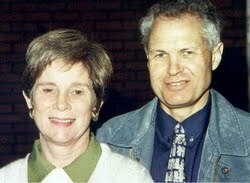 He and his wife Liz love the Lord, and have had close relationships with Him for many years. They are trustees and house group leaders in their church, and have a heart for the rehabilitation of young people. They are also gifted at listening to and advising saints with wise use of their finances.